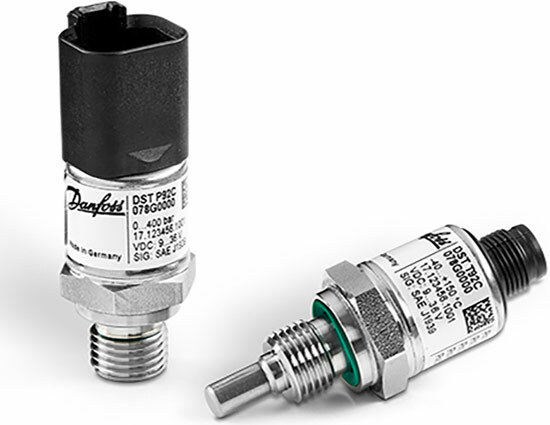 Danfoss offers the DST P92C pressure and DST T92C temperature transducers. They are designed for mobile hydraulic applications. The transducers with CAN interfaces reduce installation costs due to the simplified wiring compared with analog sensors. The CAN interface is available at an M12 connector integrated in the IP67-rated stainless steel housing. The products are robust and resistant against shock as well as vibrations. Additionally, they meet the EMC requirements for mobile machines. The products support CANopen and J1939 higher-layer protocols. The DST P92C can measure pressure up to 1200 bar. Its operating temperature is -40 °C to +125 °C. The DST T92C temperature transducer is suitable for an operating temperature from -40 °C to +150 °C.